The Web Ontology Language (OWL) has been around for a while now and is used for a variety of semantic applications. Ontologies are freely available and help developers to create models for real-world scenarios. They can be instantiated, combined and enriched using SWRL rules and a reasoner such as Hermit or Pellet. The reasons for creating such a representation of data differ: Natural language processing, reusing data across domains or contextualisation are just some of many. The data obtained is then stored in a knowledge base, from which it can be retrieved using SPARQL queries. But if it’s all already there, what’s the point of combining it with a graph database? While SPARQL certainly has its strong points – like using different ontologies at the same time and the similarity to well-known SQL – it also has weaknesses. Triple stores, which are the starting point for most SPARQL applications, consume a lot of disk space compared to relational databases. They are also slow for very large datasets. On the other hand, Neo4j stores whole graphs as opposed to “just” triples. It has an easy-to-learn and easy-to-use query language and a web-based, graphical interface which allows users to easily browse and explore the graph. Also, it is fast for querying and scales very well to handle larger datasets. There is the PROV-O ontology, which models causation and influence between activities, agents and entities. This concept is fairly abstract but useful to answer a number of questions related to the origin of entities (and what may have influenced them throughout their lifetime). The PROV-O ontology is applicable to a number of fields. For example, social networking (“Who was the author of the blog post that influenced Peter to write his mashup?”) or experimenting (“Who was the last person to access the experiment before it failed and when did he or she access it?”). PROV-O is used in the BonFIRE project, which is a multi-site cloud experimentation and testing facility. There are people (agents) conducting experiments using resources (entities). At an infrastructure level, to perform their experiments, they create, use and destroy (activities) compute nodes, storages and virtual networks (entities). After their experiment has finished, they download the results (entities) from the virtual machine for further analysis. These results are influenced by a large number of activities and agents, and often it is difficult to determine how such a result came to be, who was involved in its formation or why it is different from other results. But using provenance, these questions can be answered. In this case, bert shut down compute node 123 located on server1. This message is filled into Java classes which are used to transform them (“manually”) into triples. The prefixes used are defined in the ontology into which these triples are going to be imported. The above step is not necessary if the messages are supposed to go into the ontology directly – the OWL API could be used instead to create individuals, properties and so on. Transforming them to triples, however, serves as an interface to be able to read data from all kinds of sources as long as it’s formatted as triples. If the OWL API was used instead, the code would have to be changed every time the data changes. These triples can then be added to an ontology using the OWLRDFConsumer class from the OWL API. This adds the triples to the ontology where the reasoner can be invoked to enrich the data. So far, that’s not really special. The interesting bit follows after the reasoning has taken place. An ontology is a graph. It has a top node (owl:Thing) and classes extending it. There are individuals that belong to classes and object properties connecting the individuals. Individuals can have data properties and annotations that can be represented as node properties and relationship properties or as relationship types. The only object you need is the ontology object created earlier. It could also be loaded from a file, but that doesn’t make a difference. Create a starting node in Neo4j representing the owl:Thing node. This is the root node of the graph we’re going to create. 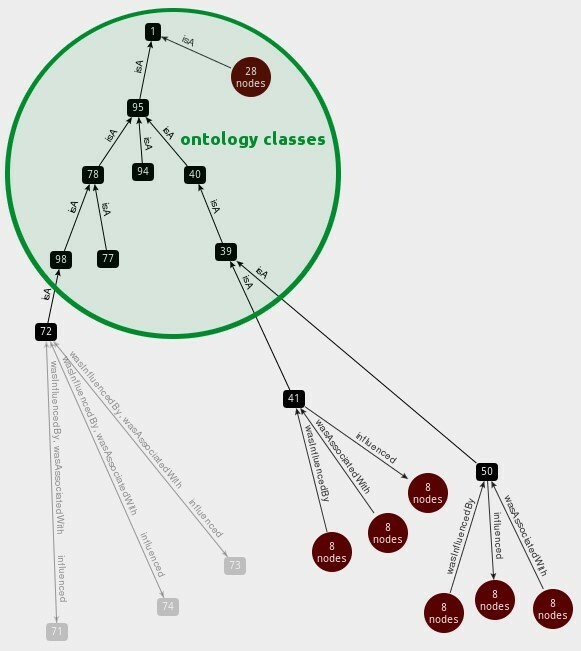 Get all the classes defined in the ontology and add them to the graph. Find out if they have any super classes. If they do, link them. If they don’t, link back to owl:Thing. Now for each class, get all the individuals. Create nodes and link them back to their parent class. For each individual, get all object properties and all data properties. Add them to the graph as node properties or relationships. Make sure to get all axioms, not just the asserted ones. That’s it, you’re done! Now for the fun bit: querying the ontology! It has the ontology as well as all the individuals and properties, represented in their “natural” form. Now the querying can begin. …or you want to do some more complicated pattern matching to find out how two experiments are different when they look the same at first glance – the only boundary is your imagination. Protege comes with a simple visualisation and the possibility to execute SPARQL queries. Neo4j has Cypher, which makes querying the imported ontology much more intuitive – ontologies are graphs after all. Also the webadmin interface allows better “exploring” of the graph. Time is not an issue in this case, because the ontology import is not time-critical. It’s done only once after the experiment has finished and imports the whole ontology. For an ontology containing several hours of experiment data, the import takes only a few seconds. Once the graph has been imported, querying is fast, which makes it a great tool to analyse and visualise ontologies. Want to learn more about graph databases? Click below to get your free copy of O’Reilly’s Graph Databases ebook and discover how to use graph technologies for your mission-critical application today. Stefanie Wiegand is a Research Engineer at IT Innovation Centre in the UK, and she is a guest contributor to the Neo4j blog. Great article! Thanks for clarifying and offering an integration viewpoint between OWL and Neo4j. I’m looking at using an Expert System (Inference Engine) Pyke, and wondered if you have experimented in using “A” Inference Engine with Neo4j? Specifically making inferences against a graph to discover patterns? I should note that for the use case it would be a dynamic data set. Thanks for the article, and any insights appreciated. Hi David, thanks for getting in touch. The Neo4j Mailing list would be the best place to ask. Great article, it is inspiring! I am digging too into NEO4J working with OWL ontology to representf some experiments and I think your article has very interesting clues. Thanks a lot for getting to this topic. After digging in this space (Semantic Web + Graph Databases) for quite I while, I would tend to say that it might be better to not directly connect schema (ABox) with instance (TBox) data. It would simply cause super nodes (dense nodes) very fast at larger datasets (and super nodes should be avoided in general). I prefer to put the class as label to the nodes. It is good to store the identifiers (URIs) in their prefixed form in the graph database (to safe space). However, this would require a namespace/prefix resolving mechanism (which makes the processing a bit more difficult in general). Besides this, a mechanism to fulfil the unique statement (triple) constraint is required, i.e., each triple (node-edge-node) should only exist once (per Named Graph) in the graph database (this needs to be checked upfront, i.e. for insert). In our graph extension in the d:swarm project (see https://github.com/dswarm/dswarm-graph-neo4j) we experimented with all this (and even more (e.g. versioning of statements (triples))). Unfortunately, right we didn’t get it to scale as we would like (so feel free to help – it’s open source 😉 ). Inserting and querying is really needed, the next level would be is to check how can you plug a reasoner on top of neo4j? One of the main powerful features of ontologies are reasoners. Did you investigate plugging an inference engine? I’m a student and I’m try to put the owl store in the Neo4j.Do you have any suggest to me ? And this article is very useful for me to understand the relationship between the owl and Neo4j.